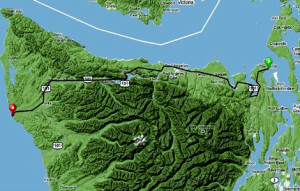 The Olympic Discovery Trail (ODT) route covers 130 miles from the Strait of Juan de Fuca to the Pacific Ocean. First conceived by the volunteer Peninsula Trails Coalition in the late 1980s, the first part of the ODT was created in 1991 near Sequim along the Dungeness River, by creating a pedestrian walkway along a 3000 ft. section of rail corridor. Work by contractors, staff and volunteers has so far completed over 50 miles of paved trail for pedestrians, cyclists, disabled persons, and day hikers. A full overview of the Olympic Discovery Trail can be found here (pdf).